Palladium is a popular metal used in all kinds of products from electronic devices to catalytic converters and you can capitalize on this metal by starting off with our one ounce palladium bars. 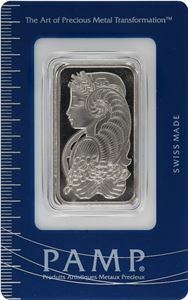 We offer one ounce palladium bars by Produits Artistiques Metaux Precieux (PAMP), a notable Swiss refinery cherished for its high quality bars featuring a creative rendition of the goddess Fortuna. The palladium bar features Fortuna, the Roman goddess of fortune and luck, holding an overflowing pile of coins flowing from a cornucopia. This exquisite design is encapsulated in a sturdy case with a certificate number and signature from an official assayer guaranteeing its fineness (.9995) and weight.